FOOT AND ANKLE PROBLEMS: SO WHAT'S SO SPECIAL ABOUT IT? 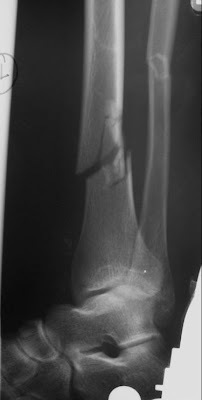 Comminuted fracture of the distal 1/3 of the tibia. 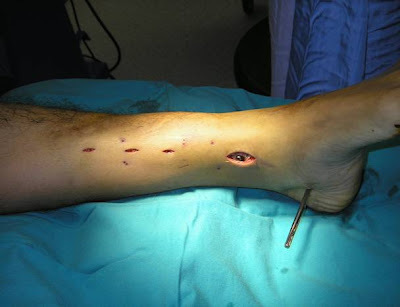 The fibula is at a level slightly higher than the tibia. 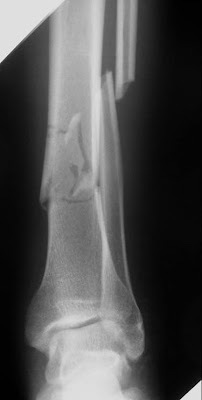 Lateral radiograph of the tibia and fibula. The foot is rotated and the fracture is oblique and unstable. 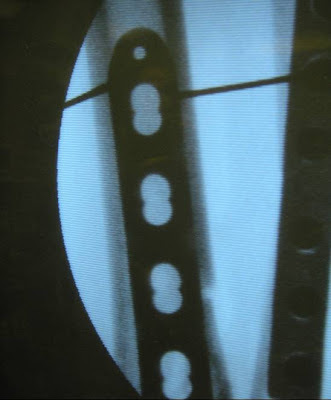 Insertion of the specialised locked compression plate through a small skin incision after adequete fracture reduction. 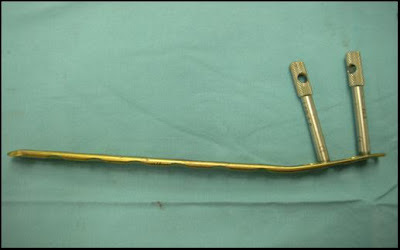 Specialised locked screws were inserted through stab incisions to complete the minimally invasive plating method. Fracture reduction seen on flouroscopic imaging intra-operatively. 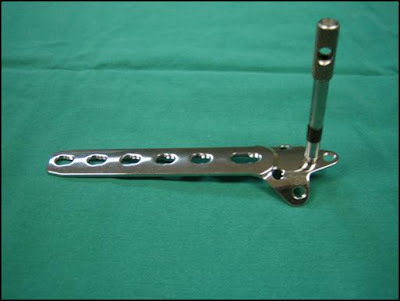 Specialized distal tibia metaphyseal locked compression plate. 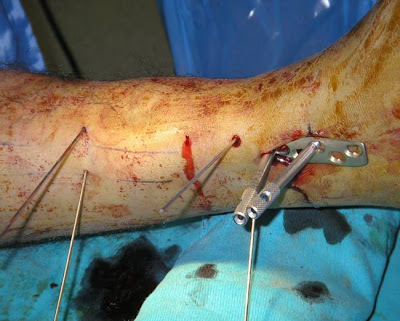 I advocate minimally invasive plating procedures where possible such as in the distal tibia because it is easier to control rotational and angular deformities. There have been a few published articles regarding this method. In an unpublished series of 120 patients that i have done over the pass 3 years, we have not had any bones that did not unite. We have had superficial skin infections up to a period of 5 months post operatively which was not related in anyway to the initial surgery. Results have need just as good as the intramedullary nail without the complications associated with the nailing technique. Post operatively, in patients with non osteoporotic bone, weight bearing will be allowed as early as 3 weeks. In my series of patients, bone union rate is on average 8 weeks. Why can we do minimally invasive plating now? Well this is mainly because of the changing technology and understanding of fracture fixation. These fractures are being treated by methods of relative stability whereby the fracture is bridges by specialized locking plates. These plates have mechanical advantages over the conventional plates of previous years. 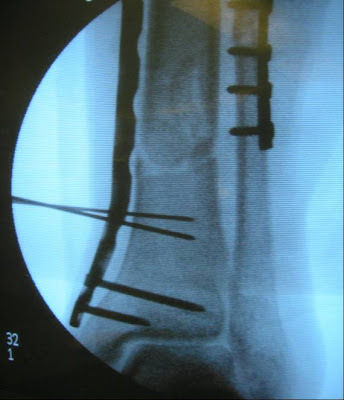 Now that the knowledge of maintaining the fracture biology is being adhered to, without making an incision over the fracture site (which preserves the nutrients for fracture healing), bony union rates in theory should increase. NB. I am speaking from my experience of these fractures and do not represent the whole orthopaedic community. All I am saying is that in my hands, this is what I will most probably do.